VanderWal Homes & Commercial Group Inc. is Canada's leading structural Cold-Formed Steel specialist with over 15 years of experience in the design and fabrication of cold-formed steel components. Our team consists of professional designers and construction experts who thrive on developing framing and building solutions that can be adapted and customized to fit any building project. Our team is dedicated to providing the highest quality Cold-Formed Steel (CFS) framing solutions in the form of CFS Truss Framing Packages, CFS Floor Framing Packages, CFS Panelized Wall Framing Packages, and CFS Construction Accessories. VanderWal Homes & Commercial Group Inc. strives to maintain nationwide presence and is in an unrivalled position to deliver to any location in Canada. With a state-of-the-art fabrication facility and a focus on delivering the highest quality pre-engineered components, VanderWal Homes & Commercial Group Inc. is the construction industry's leading supplier of specialized steel structures. Cold-formed steel components are manufactured to the exacting standards and with the precision required by the most sophisticated modern construction projects. Prefabricated cold-formed steel framing components can reduce installation time by up to 75% and can eliminate the need for multiple on-site trades/labour. VanderWal Homes & Commercial Group Inc. continually works to supply the most cost-effective and efficient building solutions while not compromising on our dedication to high quality of workmanship. We are dedicated to improving the construction experience of each of our clients. By using materials manufactured for superior consistency and a fabrication process focused on quality, VanderWal Homes & Commercial Group Inc. is able to deliver products that are the best long-term investment for all of their clients. The numerous advantages of cold-formed steel components make it the ideal framing material to be used across a wide variety of building types and applications. Construction projects ranging from commercial, industrial, residential, retail and agricultural end uses can be completely framed using cold-formed framing solutions provided by VanderWal Homes & Commercial Group Inc. Our team can offer turn-key framing solutions for any application and to date, our systems have been utilized in complete structures such as hotels, condominiums, long term care facilities, high-end single family homes, restaurants, water/sewage treatment plants, storage facilities and multi-residential buildings up to six stories high. The extreme versatility of cold-formed steel also results in building components that are ideal for use in combination with alternate construction systems. To discuss how to maximize the benefits of cold-formed building components on your project, contact us today! Galvanized cold-formed steel offers a unique combination of benefits that set it apart from other framing materials. Cold-formed steel framing is produced with uniform quality and consistency not available in most construction materials and provides the highest strength-to-weight ratio of any common building material. The Cold-Formed Steel used at VanderWal Homes & Commercial Group Inc. is made from structural grade sheet steel (20 – 12ga.) that is hot-dip galvanized, rolled and cut into coils. It is then manufactured into varying shapes on high-speed, continuous roll-forming machines and cut to specific custom lengths during this process. As the name suggests, no heat is used in the forming process so the steel maintains the physical properties obtained through the creation process. Cold-formed steel offers superior strength, consistency and integrity in comparison to other building materials, while still providing the versatility required to allow designers freedom from strict design constraints imposed by other materials. 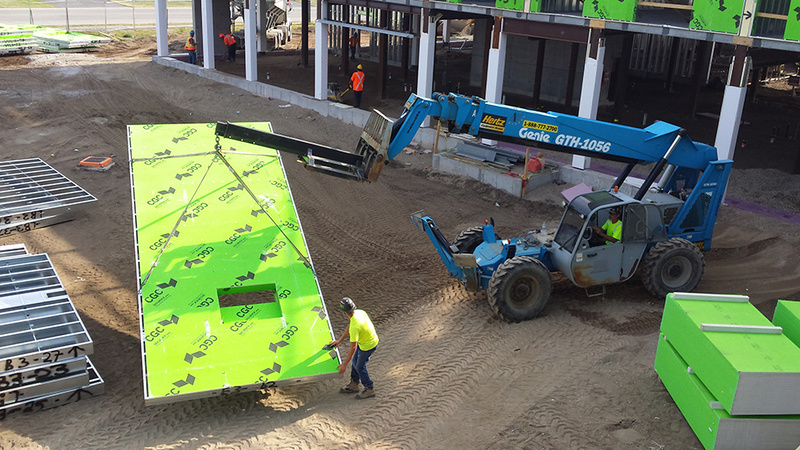 By prefabricating trusses and panelizing wall and floor assemblies, VanderWal Homes & Commercial Group Inc. circumvents the errors commonly attributed to stick-framing or on-site fabrication. Controlled facilities are designed for and dedicated exclusively to the fabrication of cold-formed steel building components, with state-of-the-art technology employed to ensure adherence to exact measurements. Precision and accuracy are paramount in the fabrication process and our relentless commitment to quality control ensures a premium product delivered to the construction site. Skilled, experienced professionals ensure that each individual component is formed to the exacting standards required by modern construction sites. Non-combustibility is a straightforward life safety advantage of cold-formed steel framing as the framing contributes zero fuel to a building fire. Building Codes in Canada recognize the advantages of non-combustible construction by offering design freedoms not granted in buildings constructed with combustible materials. There are fewer floor area restrictions when using cold-formed steel framing, in addition to less stringent and possible elimination of sprinkler system requirements. The National Building Code of Canada recognizes the necessity for non-combustible construction, as all new buildings over six storeys in height must be specified as non-combustible. Insurance underwriters also recognize the inherent benefits of cold-formed steel as a framing material and adjust their premiums accordingly, saving some building owners as much as 70%. The dimensional stability and consistency inherent in cold-formed steel framing can stretch the intended life cycle on a building, reduce the long term cost of ownership and maximize the return on initial investment. Structural cold-formed steel components provided by VanderWal Homes & Commercial Group Inc. are hot-dip galvanized to a minimum Z180 (G60) finish for longevity. Studies have shown that even in the most aggressive climates, the projected structural life of a cold-formed steel member extends into centuries. Cold-formed steel does not crack, shrink, warp or twist and it retains its geometric properties almost indefinitely. This unwavering uniformity means that wall, floor and ceiling finishes remain straight and true and require minimal repair work as a result of time passage. Buildings constructed with materials of such permanence will maintain a tight building envelope, avoiding unwanted air and moisture leakage, resulting in better control over heating/cooling costs. Prefabricated cold-formed steel framing really comes into its own during the installation and building phase of a project. When panelized wall and floor systems are combined with prefabricated trusses, VanderWal Homes & Commercial Group Inc.'s system can reduce install time by as much as 75%. Prefabricated cold-formed steel framing requires fewer workers on the jobsite and enables workers to use their time more efficiently. The result is a direct reduction in the time required to erect the building structure. 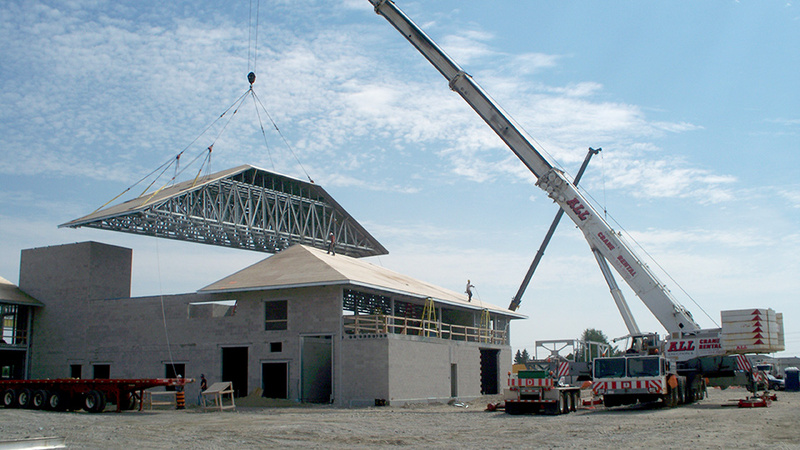 When space on the jobsite allows, trusses can be assembled into sheathed roof sections which are hoisted into final position by crane. Grade level assembly makes a safer environment for employees by eliminating working at height and allows for simultaneous assembly of roof and support structure. All of VanderWal Homes & Commercial Group Inc.'s Cold-Formed Steel framing members are manufactured in Electric Arc Furnaces (EAF) that typically utilize around 95% scrap or recovered steel. There is absolutely NO landfill waste created by any of VanderWal Homes & Commercial Group Inc.´s processes as everything employed can be recycled. Employing structural cold-formed steel framing can assist in the accruement of LEED points toward an overall LEED building certification. Cold-formed steel is impenetrable to outside organic intrusions which pervade alternate building materials. It does not provide a source of food for infestations such as mould, termites, insects or rodents. Cold-formed steel is completely inorganic, and consequently there are no off-gases emitted into the building envelope (as there would be from drying lumber, for example) to compromise air quality and exacerbate respiratory problems. Cold-formed steel is also completely invulnerable to environmental changes during the construction period. It is not susceptible to freezing temperatures and will not absorb moisture, gases or other foreign elements which will then migrate from the material unexpectedly. Cold-formed steel can effectively be utilized in practically any building application. Boasting the highest strength-to-weight ratio of any common building material, it may facilitate the upward expansion of a building not originally designed for an extra storey. Prefabricated cold-formed steel roof truss systems can provide long, clear roof truss spans (up to 25m or 80'), which allows designers to incorporate large open areas without intermediate columns or bearing walls. VanderWal Homes & Commercial Group Inc. has successfully engineered and fabricated some unique shapes, including curved trusses and dome roofs, condominium turrets, solar panel frames and advertising billboards.